Artful Affirmations: Tea Cup Tuesday-Gorgeous! This week I have one of my favorite trios to share with you. 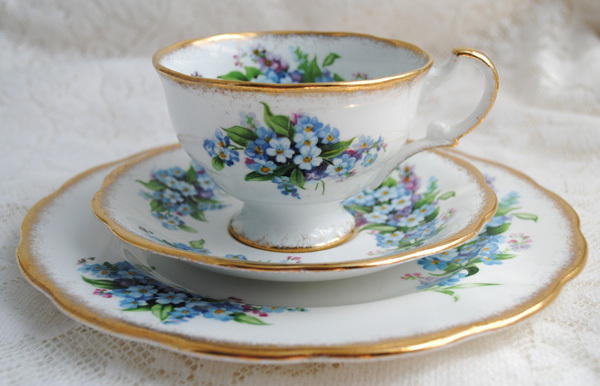 We have seen many really beautiful Forget Me Not tea cups over the past weeks. I love each one. I only recently found a set for myself and I am delighted! I adore the multi blue flowers and the shape. I found this set in Williamsburg, Va. at a beautiful shop called High Cotton. This shop was featured in Victoria magazine recently and prompted my visit to the area. The shop was incredible, and I had such delight looking around, especially when I spotted this set tucked away in a hutch! The generous gold trim really caught my eye! A fancy split loop handle with a spur. The handle is all gold from this view. This white set is generously decorated with beautiful bouquets of flowers. Such vivid shades of blues and lilacs. ....please correct me if I am wrong. Chapmans Longton Ltd. The back stamp came into use around 1949. Thank you so much for stopping by to visit today. I love having you over! If you have not yet entered in my Happy June Giveaway, click HERE to go to the post that lists all 4 of my giveaways. Enter for each one, or just the ones you love. I will be picking the winners June 30th. Martha and I love hosting this party about tea cups, because we get to share something we appreciate, and because we get to meet with all of you! If you would like to join in the party this week, go and create a post with a tea cup in it and then come back here and link up below. We have a new linky system this week and we hope all goes well with it. Let me know if you have any difficulty and I will see if I can help. 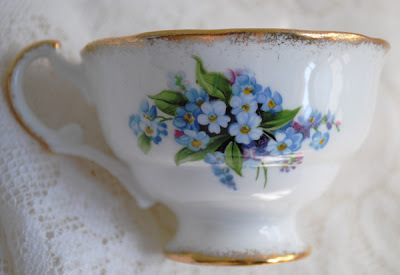 My post today is more about my Mom's Birthday and little to do with tea (other than a picture of us having tea) so I won't be linking up this week...however...this teacup is so so pretty. I usually never find one that has the matching dessert plate and my mission is to find a trio! This cup has a certain elegance that I am drawn too...I love it!! I wish you a Happy Tea Cup Tuesday!! Feel free to link this treasured jewel up. Best to you ....Have a GREAT WEEK! I love that set. The painting of the forget me nots is beautiful. Beautiful Tea set, Terri. Love the Forget Me Nots, so dainty & sweet. 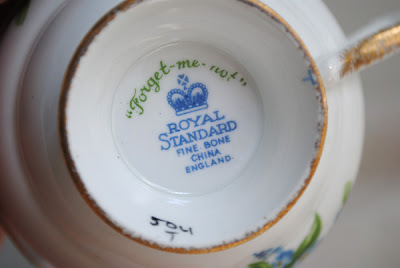 My Granny had Royal Standard, she was from Scotland & She had some lovely tea sets. I enjoy your unique blog. Your teacup trio is stunning. Love the tiny forget-me-nots; really precious! Thanks for sharing and Happy Tea Day. Your tea cup is beautiful. I really didn't post a tea cup, but the glasses are French pressed glass. Thanks for having us! minha postagem é tema tomando chá com a fada Lilas! Such a beautiful forget-me-not teacup!! The gilded edge really dresses it up. Terrie, I love ForgetMeNots! They are so sweet. Your trio is fabulous! Thanks you for hosting such a lovely "show and Tell"
Terri - that is so lovely! I adore it. this is such a sweet cup. Love the Forget me not flowers so much. Thank you for sharing this pretty cup so detailed and for hosting this fun event. How very sweet,- and beautiful. 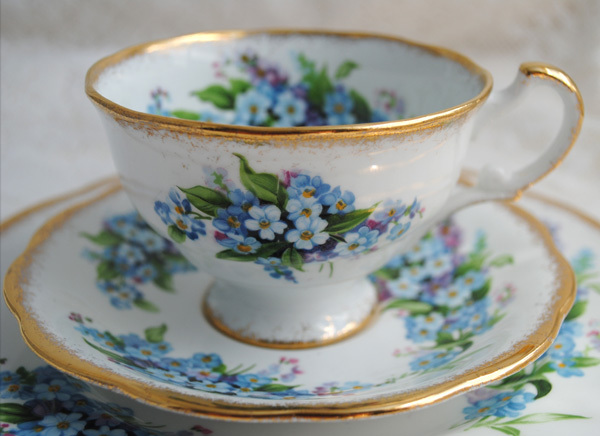 Love forget me nots, and do have lots of them in my garden- and this fine, cup and saucer are the most beautiful paintet set. Have a lovely wednesday, Terri. Beautiful cup as usual!! So sweet and feminin. Terri I am participating exceptionnaly to your teacup Tuesday party! Oh, GORGEOUS !!! lovely cup with lovely flower and thank you for hosting!!! Well, my secound name is Miyako (都）and "Forget Me Not" is (都忘れ、foget 都) in Japanese. Haha, funny name for me because I don't want anyone to forget me. Wishing you a happy week from Japan, Orchid. 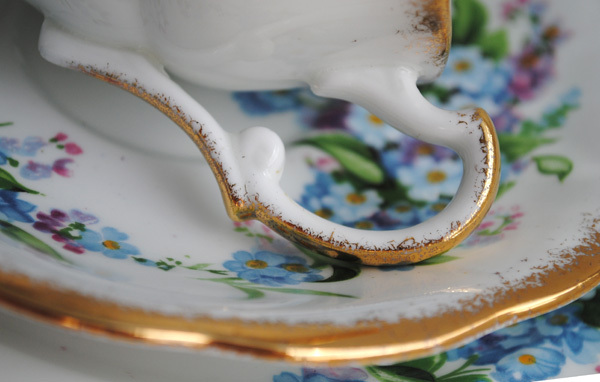 I enjoy learning about the styles of teacups and the terminology!! Drop by my blog for Tea on Tuesday, if you get a chance. Love the blues! Love forget-me-nots! Really love Williamsburg! I'm joining the fun for the first time today at Arful Affirmations Tea Cup Tuesday. I don't have a very spectacular collection, but when I have a worthy post, I shall share. Beautiful things inspire . . .
You picked the right title for this post - gorgeous!!! I love the delicate flowers and the colors are so beautiful! Thank you for hosting our tea party and sharing your treasured find! I love this trio! Williamsburg ... say no more!!!!! Happy Tea Day! I love your new set. What a beautiful find. Your tea cup is really gorgeus! Terri, Your tea cup is stunning! I have a few forget-me-nots in the garden; some pink, some blue...yours are prettier! Have a wonderful day, and thanks for hosting Tea Cup Tuesday! I so adore the forget-me-not flower. What an incredibly beautiful teacup. Also, I loved seeing what the others have shared. This is such a lovely set. 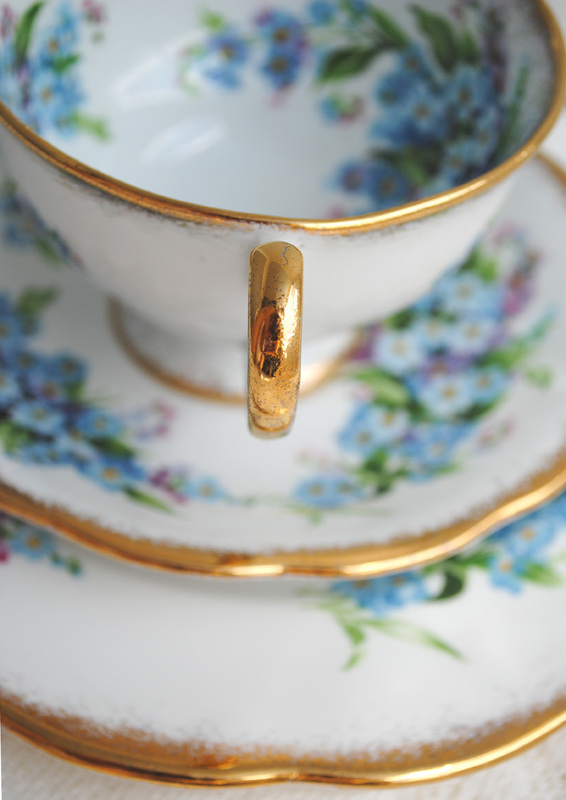 I also love how the gold seems to be stippled/feathered out into the white area of the cup and saucer near the rim. Just beautiful! Simply gorgeous and stunning! Oh it makes me want to go tea cup shopping. 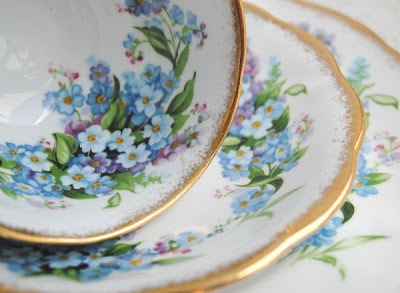 This pattern is so very pretty, it reminds me of my own desire to collect more china for my own tea parties! So far, I've the jam service set with tiny spoons, and one cup with matching saucer lol! I guess I have a ways to go! Hi Terri, love your Forget Me Not pieces...so dainty. TFS. I have linked to this post, had a little trouble linking & now see I've linked twice...apologies. How pretty Terri! I just ADORE blue flowers!! They make me think of bluebonnets. Your tea is so pretty. Thanks for hosting this lovely tea party. Oh my goodness, what a stunning set! No wonder you are so proud of them. I would want to sit in a Victorian dress to sip tea and eat scones from these treasures. Terri, I just love forge-me-nots, and this set is lovely! In fact, I think I'll have some tea now...you just put me in the mood. I sweetly admire the dash of pink amongst the blue flowers - very delightful. Terri, I'd be honored for you to come by and enter my give-away. Sooo pretty...i love blues..and those sweet flowers are just gorgeous..floral scenes on cups are just magical aren't they!! Beautiful as always Terri..and always a joy to visit your space..such beauty and delight! My, what a beautiful post cards. I think I should be creative as them. Should give a try. Btw, your forget me not teacup is so sweet. I should look for one. Thanks for sharing. Hi, I came by way of Trish's Tea party and am late! 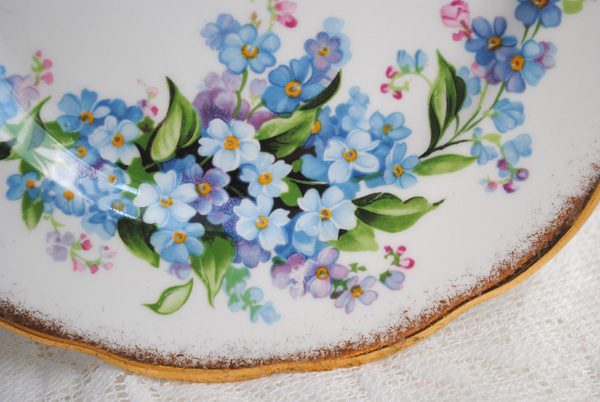 Your cup/saucer and plate of forget-me-nots is charming. Yes, the colors are very vivid. Love the gold edging. I also peeked at the post right ahead of the tea party one, so many creative artists out there doing crafts. Delightful selection of wonderful teacup they have created. Thank you for sharing lovely posts. Blessings. These tea cups are gorgeous. It's always nice to have a tea party with a beautiful set. Jewelry For Me and My Happy June Giveaway! Tea Cup Tuesday-What I love about Tea! Next Happy June Giveaway and new Video! More Fun with Dominos! Mixed Media delight! Tea Cup Tuesday-Happy June Giveaway!